Gabrovo, known as the "laughter capital" of Bulgaria, celebrates April Fool's Day on Monday. 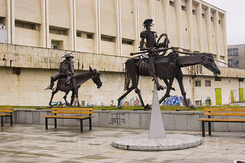 Gabrovo is located some 220 km North-East from the capital Sofia. The city's residents are famous for their unique sense of humor and stinginess. The citizens of Gabrovo are known to enjoy poking fun at themselves. They often claim to clip the tails of their cats to keep the room warmer and stop their watches at night to spare the worn-out of the cog-wheels. The city is also the residence the renowned House of Humor, which marks Sunday its 41th anniversary. Monday will be a day of free entry for all visitors of the museum, according to the Bulgarian National Radio.